Tech Week: C-E-Bros, Diversity Numbers And The Beats Deal : All Tech Considered The Snapchat CEO's fraternity-day emails surfaced, Apple made its biggest acquisition and Google disclosed the uneven gender breakdown of its staff. Take a look at the week's top headlines in tech. 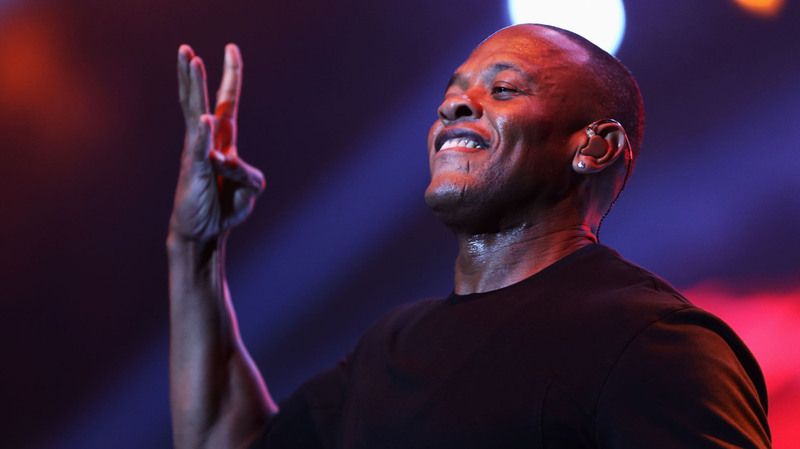 Rapper Dr. Dre is an executive at Apple, now. Bros in The Valley: As companies like Google and Snapchat seek to lead the new information age, they are looking pretty backward when it comes to equality and diversity. Google's figures show the company is 70 percent male; African-American and Latino employees don't register above 5 percent. Meanwhile, Snapchat's Spiegel's emails detail his tactics for getting girls drunk and jokes about "peeing on" women and "shooting lasers at fat chicks." He apologized. Time Magazine writes "the days of Chief Executive Bro are numbered." The Google Car: The search giant has manufactured a prototype driverless vehicle and it looks like a cross between a Smart car and that Little Tikes plastic car you might have had as a kid. No steering wheel, and it goes about 25 mph. But as Venture Beat writes, a partnership with Uber could make this viable as smarter, greener transportation in the future. Billion-Dollar Beats: Apple made it official, announcing its $3 billion deal to buy Dr. Dre and music industry veteran Jimmy Iovine's Beats Music. Dre and Iovine are joining Apple in unspecified executive roles. The news led to a lot of Monday morning quarterbacking about whether Steve Jobs would have made a deal like this, but both sides seem to be pleased as punch, for now. In the wake of last week's U.S. indictment of Chinese hackers, a well-reported piece detailing the reach of Chinese cyber-espionage. The journalist who broke the Snapchat CEO's emails talked with Longform.org's podcast about covering modern-day Silicon Valley. Biddle describes an industry of "overgrown, entitled manchildren pulling price tags out of the ether." Remember the universal translator imagined in Star Trek? Microsoft showed off the Skype Translator, doing near real-time audio translation from English to German and vice versa, and said it would be available as a Windows 8 beta app by year end.